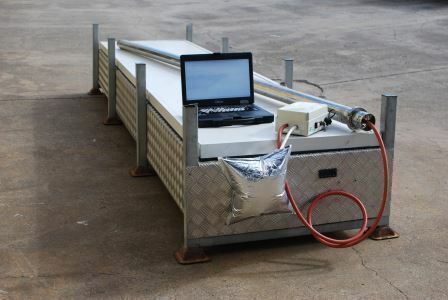 Sigra provides a comprehensive service to measure the gas content of coal core retrieved by wireline. This is a service that is unique in its accuracy and completeness. It provides solutions that are useful in the assessment of outburst risk and the prediction of gas release from in-situ and cut coal. Our procedures are outlined below. Sigra core desorption canister connected to automatic desorption monitor and gas collection bag sitting on controlled temperature bath in which the canister would be placed. To time the core cutting and retrieval process. To place all core containing more than 300 mm of coal into a canister ( 1 m or 3 m) without delay for any logging. To automatically monitor the rate of gas desorption in approximately 20 ml steps each of which has a time stamp. To place the core in a temperature bath held at seam temperature. To collect all gas released and to re-measure its volume to check the consistency. To continue desorption until approximately 80% of initial gas has been released. To analyse for gas composition with multiple samples to detect compositional change. To log the core for coal type and cleat infill and measure apparent relative density of each ply group identified. If the core has apparent cleat carbonates, to test these with acid for reactivity – this may then lead to a more precise measurement of the effect of acid leaching, which has a direct influence on permeability. Accounting for water vapour as a component of gas volume release from canisters. This can produce a 7% error at high seam temperatures. 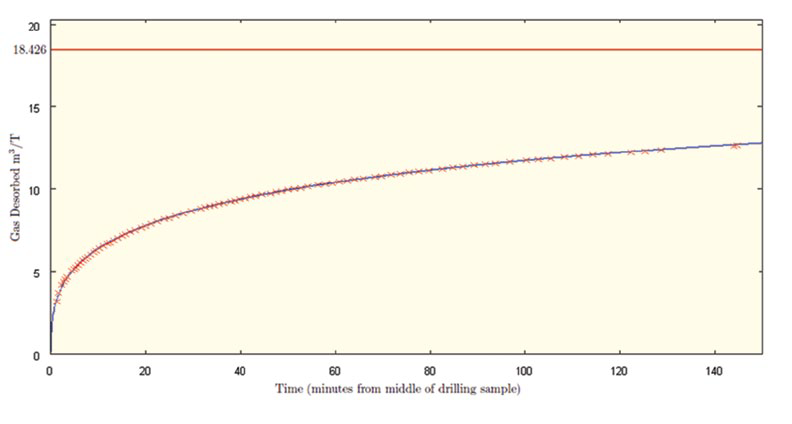 Using the standard method based on the square root of time plot of early desorption and an assumed start to desorption. As part of this test the Apparent Diffusion Coefficient (DA) is calculated. This is a calculation of the diffusion coefficient based upon the initial slope of cumulative desorption versus square root of time plot and the total gas content. The calculation is based on the core diffusing as though it were a uniform cylinder. As no coal core is without some inhomogeneity and fractures DA is in fact a combination of the both the diffusion coefficient and the fracturing within the core. It is useful in modelling the gas release of cut coal and as an indicator of outburst proneness. By a more rigorous approach which models the actual process of desorption from drilling right through to crushing for residual gas. In this a numerical model of diffusion based upon the diffusive behaviour of a fractured core is fitted to the measured core desorption. One of the inputs to the model comes from logging the core in the form of choosing a suitable core fracturing model. The software then refines this to arrive at an improved fracture distribution and the associated diffusion coefficient. Using this information with the volume of the remainder of gas collected during crushing, and either the measured or estimated sorption isotherm, enables a far more accurate estimate of lost gas to be made through a numerical model. This actually models desorption through the changing pressure in the borehole as the core is retrieved and during the period on surface when gas is being lost from it. Characterising the shape of the desorption curve both in terms of the standard desorption time (tau) for 2/3 of total gas desorption and for departure from standard Fickian diffusion. Calculation of the gas content of the carbonaceous fraction of the core coals on a mineral matter free basis. Calculation of the average gas content of the seam including multiple canisters and core loss. Sigra’s estimate of gas content through these procedures far exceeds the AS 3980-1999 Standard. Initial exploration drilling – where the client wishes to avoid coring. Production hole drilling – where the client wishes to firm up knowledge of gas contents during the drilling of production holes. Where free gas is expected in such formations as porous sandstones where the gas would be lost on coring. Where the entire gas content of the stratigraphic sequence needs to be measured. The system is not intended to replace gas content determination from core where this is targeting one or two well known coal seams or where core is required for other purposes. The system is however particularly useful in that it provides an absolute measurement of gas content through all the strata drilled. Drilling rod head position measurement device. A dribble prevention valve at the water swivel. A pressure relief valve behind the bit. A rotary seal at the top of the hole. This may be fitted above the casing or over the BOP. A rate counter on the mud pump. A cyclonic separator placed between the outlet of the rotary seal with outlets for the gas flow meters and to the shaker. Gas flow and composition logging equipment. The ability to sample cuttings off the shaker. These are simple additions to most drilling operations. The most basic test of reservoir properties is the assessment of the reservoir pressure and gas content. Gas content is customarily measured by taking core, placing it in a canister, and measuring the gas it desorbs. This technique has limitations in the underground environment because the coal is desorbing from the time it is cut and because the time it takes to retrieve the core may be excessive. Frequently the assumptions used to arrive at a lost gas from the core are violated because of the time lag before the core can have its desorption rate measured. There are significant advantages to be had from drilling and flushing cuttings from a hole for gas content measurement. This can be done using either air or water. The former offers the quickest return of cuttings and is appropriate in drier seams. It is shown schematically in Figure 1. Here the chips are collected very quickly. The volume of cuttings from a given section of drilling may be measured and used as an indicator of sheared or otherwise outburst prone coal. Nonetheless it is quite possible to water flush shorter holes at a high rate, while collecting the chips and placing them in a canister for desorption. 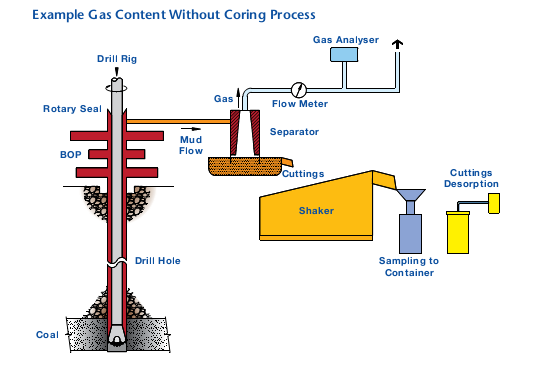 Once canister desorption has slowed, it is possible to grind the cuttings to determine the residual gas, as would be customary in core desorption. The gas lost while the cuttings are in transit is determined by the solution of the diffusion equations for desorbing particles. To do this the particles are sieved to get their sizing range. Not only can the gas content be determined but so too can the diffusion coefficient of the coal. This process can yield highly accurate results.